The quest for next year’s Yellow Jersey is going to be one steep ride. It seems like just yesterday 34-year-old Cadel Evans assumed the highest step on the podium on the Champs-Elysees, becoming the first Australian to win the 2011 Tour de France title. 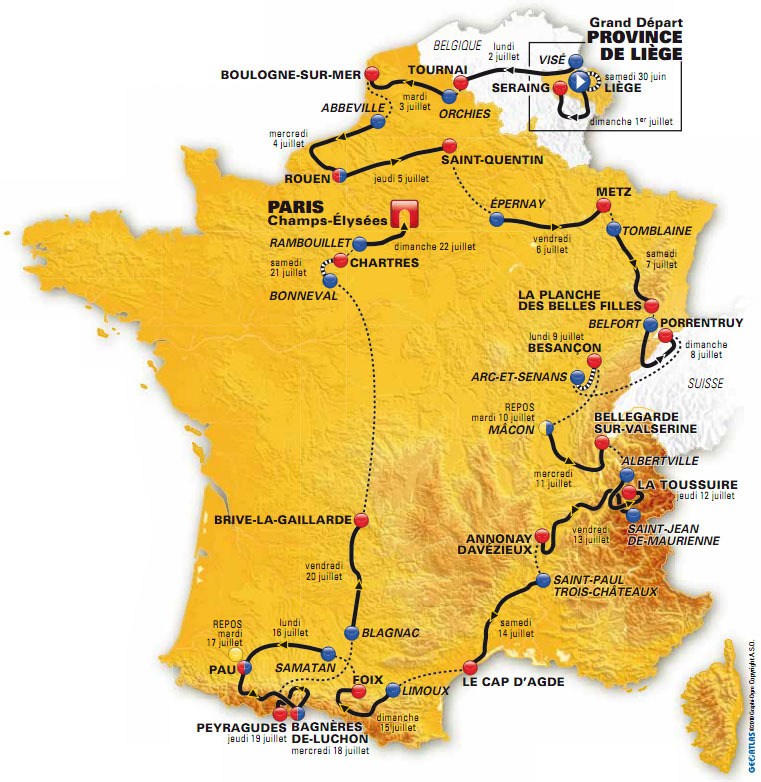 However, the Tour’s 99th edition just got one step closer following the announcement of the race’s 2012 routes at the convention center in Paris. 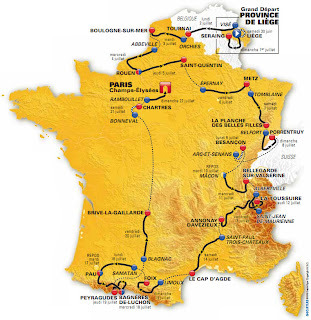 The 2012 Tour de France will bring fiercer mountain climbs and longer time trials. With 9 flat stages, 5 mountain stages, its clear next year’s contenders will have their work cut out for them. The tour will commence on Saturday, June 30 in Liège, Belgium – where the prologue will begin. The race will make its way through France before concluding in Paris on July 22. Covering a total distance of 3,479 kilometers, the 2012 Tour route will feature 20 stages with two individual time trials totaling 96.1km, more than double of last year’s total and the most time-trial mileage since 2007. Competitors will reach new heights on 5 new mountains summits. Riders will be introduced to the Côte de Saulcy in stage 7 in Porrentruy, before facing the long stretch to the stages’ finish atop the brutal Planche des Belles-Filles in the Vosges, featuring a staggering 20-degree gradient. Another ascent debut is the Col du Grand Colombier in the Jura Mountains, followed by the steep Col de la Croix in the Swiss Jura Mountains, which is an intimidating 2 mile long stretch with a gradient of 9.2%. Finally, we move into the last pass – and a daunting one, at that. The Mur de Péguère is 9.4km long, with gradients sometimes reaching 18%, a rarity in the race’s history. The 2012 Tour De France will take us through beautiful landscapes and historic towns in some of the most stunning regions in the country. Once again, the route will pass though the heart of “La Douce France,” which includes the villages of Normandy and the regional city of Rouen, the location of St. Joan of Arc’s execution. While defending champion Evans is an obvious choice, 3-time Tour winner Alberto Contador can regain his title due to his luminary time trial skills. Britain’s Bradley Wiggins is another favorite because the extra time trials could serve in his favor. And Tour runner up Andy Schleck, a superb climber, may just surprise everyone and finally take a step up on the podium. Also noteworthy are the vineyards of Champagne and its capital Epernay, known for its bubbly. Moreover, the race will visit the rolling hills of Southern Burgundy and its old town of Macon, with a history dating back more than 2000 years. I’m thinking it should make for an epic one. If you plan to visit France to witness the 2012 cycling event, enrich your experience with a Land Tour of the regions visited by the tour - Normandy, Champagne and Burgundy, or celebrate the race by taking a Bicycling Cruise.